Experience the blistering speeds and thrilling combat of hoverjet racing during the sport's raw, formative years. GRAVITAZ. 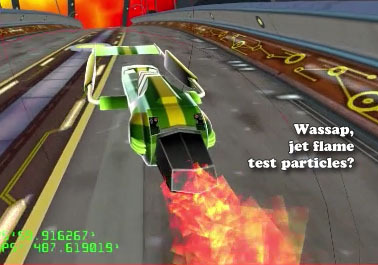 A high-speed game of combat racing. Pilots fly jet-propelled hover vehicles (known as “Spinners”), hoping for fame and glory on the bleeding-edge, rough-and-tumble tracks of the world’s first antigrav racing league. Coming to PC/Mac/Linux downloadable marketplaces (and iPhone/iPad, depending on funding level). 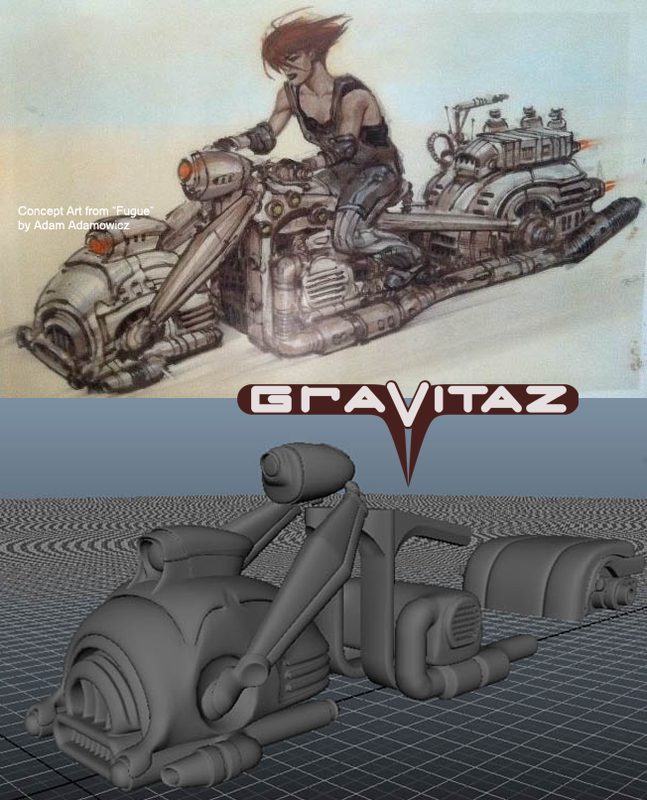 The world of GRAVITAZ is similar to ours, but a few years ahead on the technology curve. Antigravity racers are new, ranging from scratchbuilt garage projects to small, sponsored team builds. The sport itself is in its formative stages; large racing conglomerates and multinational leagues do not yet exist. Despite a weak global economy, stunning advances in antigravity technology has fans lining up to see even short glimpses of trial runs and vehicle prototypes. As Spinners scream down the corridors of temporary urban raceways, it's clear: antigrav racing will be the sport of the new millennium. GRAVITAZ aims for a grittier, “real world” feel that evokes a motorsport in its early days. While decidedly futuristic, Spinner vehicles sport dust and scratches, bad welds, and even bits of duct tape. Tracks show obvious gouges and scrapes - after all, grav-fields and rollers don’t always do their jobs! The overall look blends the sleekness of futuristic concept cars with the oil and heat of an F1 Grand Prix race. With antigrav racing in its infancy, technology and design have not coalesced around any unified standard. Spinner form and function are diverse and experimental, sporting wildly different configurations. Teams compete for sponsorship money wherever they can, and the resulting vehicles reflect their widely different emphases. Some Spinners may use aerospace components from high end jets; other teams may incorporate pieces from prior generations of wheeled racing technology. Anything and everything that could grant a performance edge may find its way onto a Spinner. In the world of GRAVITAZ, the big money (and even the necessary tech) to build permanent, dedicated racing hovertracks does not exist. Much as in F1 racing, racetracks are temporary structures, built to be dismantled after use. Raceways are defined by cordoning off city streets; scaffolds create vertical tracks that crawl up the sides of skyscrapers. The tracks are assembled with only two goals in mind: to create novel racing routes, and to create plenty of seats for paying fans. 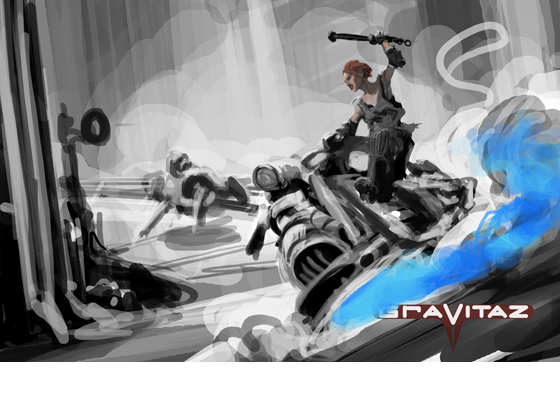 Like the gameworld itself, GRAVITAZ’s sound design is less sci-fi smoothness - and more real-world rough. Jet engines splutter and backfire, spitting exhaust. Metal struts groan and creak around high-g turns. Shield generators buzz and snap like Van de Graaff generators, hissing angrily at incoming damage. The music for GRAVITAZ follows suit: adrenaline-pumping, high beats-per-minute cybergrowl, the kind that gets your accelerator foot pounding a rhythm on the floor. The soundtrack features heavy use of analog instrumentation and highlights clear punk influences. You might even catch some vocals here and there. Look forward to some crunchy, high energy tunes. We’ll be honest: trying to describe GRAVITAZ without mentioning WipEout would be difficult. Our love and respect for that franchise is no big secret. There’s no question that WipEout is a helpful reference point when describing GRAVITAZ; we wouldn't try to deny it. However: as much as we might enjoy all manner of other racing games, GRAVITAZ stands apart. Our team aims fill a void in the genre on PC/Mac/Linux, and to break new ground in the “combat racing” genre across all platforms. GRAVITAZ hovers menacingly all on its own. GRAVITAZ utilizes an upgraded version of the ORKID mediaEngine. 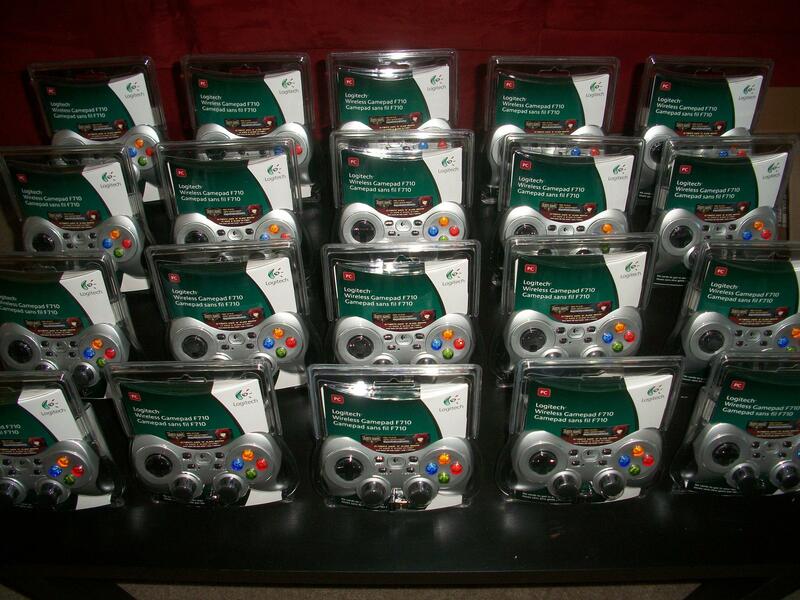 It fully supports PC, Macintosh, Linux, and current-gen consoles. At this time, a PC/Mac/Linux release is planned, via Steam, Desura, and/or other digital distribution avenues. The game may be released on other platforms as well, depending on overall funding level. 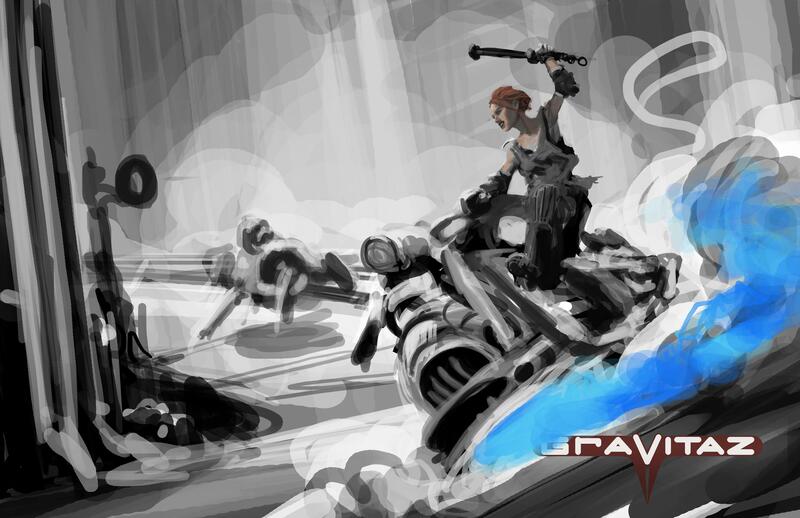 Anyone pledging $30 or above also receives GRAVITAZ: The Card Game. It’s a side project Dennis has been working on for a while; his goal is to create a fast tabletop card game that can duplicate the fun of a race. This is not Milles Bornes, mind - we’re talking a high-energy card game of racing and combat aimed at 2-5 players. None of the money raised will go to its development - the card game is already underway. It’s purely a fun after-hours project that happens to perfectly fit the GRAVITAZ vibe. Though our tech is basically finished, a game isn’t about an engine; it’s about content. At the moment, we have exactly one artist/designer to create that content. His name is Dennis: he’s a mammal, he enjoys receiving paychecks, and he seems to have some strong and curious addiction to carbon-based food. Up to our funding goal, all money we get will be thrown directly to Dennis - so that he can stay alive long enough to finish the game. We estimate that it’ll take him about a year to design and implement all the Spinners and racetracks, and tweak and balance the gameplay. The funding goal gets him through that, and to release. If, thanks to fans like you, we exceed our funding goal - which would be fantastic, by the way - we’ve got some other things in mind. First: We’ll have the budget for even more, and better, audio. There are a number of people volunteering their time on this. If we can give them even more time to compose EVEN MORE crunchy music... that would be pretty swank. Second: We can create more content. Paying more humans to help Dennis with vehicle construction and track design would substantially increase the amount of cool stuff we can cram into the final game. Third: If we exceed our goal by enough, it will enable us to realize our big pie-in-the-sky goal... GRAVITAZ on iPad/iPhone! Our engine still needs additional work to be fully functional on iOS, and we would have to nail down solid control options, but... imagine the possibilities. Sitting there, with your touch device of choice (possibly in a bathroom, but let’s not imagine that part), rocketing along on a hovertrack at the speed of sound... thumping music blaring from the speakers... swiping your fingers on smooth glass to glide around curves. It’s a beautiful thought, and one that we’d like to make a reality. Fourth: If we somehow blow way, way, way past the funding goal, a console release is in the realm of possibility. Our engine already runs on XBox 360, and we can tweak the tech for optimal PS3 performance. It could happen. Any publishing partners who’d like to chat are welcome to contact us: business@glassbottomgames.com. We’d love to hear from you. Whether you choose to throw in a pledge or not, we appreciate the time you spent just reading our Kickstarter. If you want to see this succeed, spread the word - Twitter, Facebook, Google+, Digg, anywhere you hang out. Heck, even call your grandma and see if she digs the idea of antigrav racing on her phone. It’s through people just like you that we’ll reach our funding goal, and without fans like you, all the money in the world wouldn’t help us a bit. So, from all of us here on the GRAVITAZ team and at Glass Bottom Games - thank you, from the bottom of our hearts. Now let’s make GRAVITAZ a reality! Gravitaz's Kick page is one day old and I'm already kinda blown away by the response - at the current rate *fingers crossed*, we'll double our goal. LET'S KEEP IT UP - SPREAD THE WORD!! I am deeply grateful to see my friends backing our project, and especially delighted to see Backers coming in from all over the interwebs, so keep talking about it! Your cash makes Gravitaz happen - your referrals make the cash happen! New videos showing the current state of the game (it's already gotten better - see pic below). Progress reports towards a playable demo, as well as multi-platform support. Screens and vids of new assets as they are made. Details on the Gravitaz Card Game. 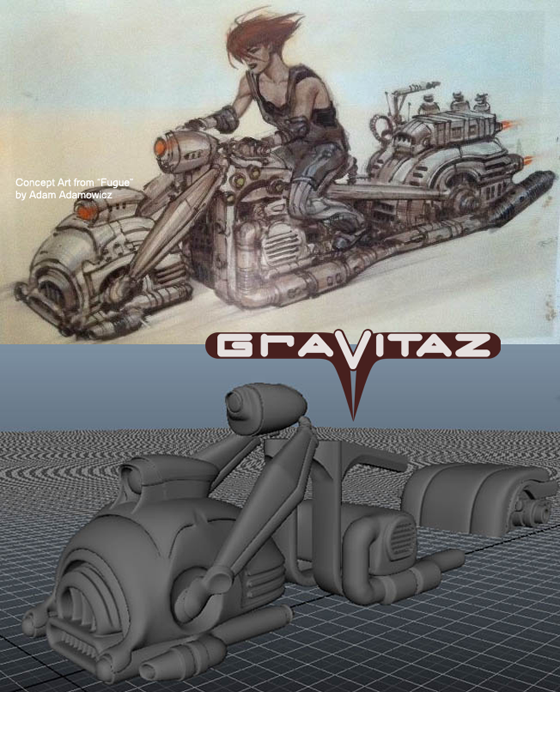 4/16/2012: GRAVITAZ blew the doors off its Kickstarter, and we’ve already hit 14% - fantastic! To celebrate, we’re unveiling some new information. Weapon details, track design theories... maybe even some new swag for supporters. 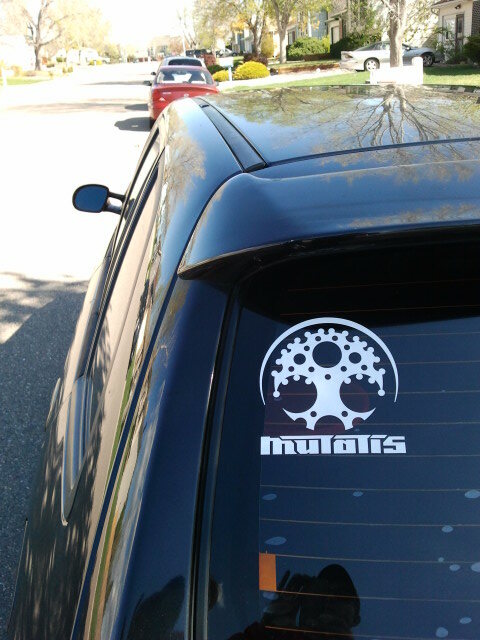 We had a few prototype vinyl bumper stickers made up, and they look pretty great. What better way to celebrate a racing game than by slapping it onto the back end of your car? 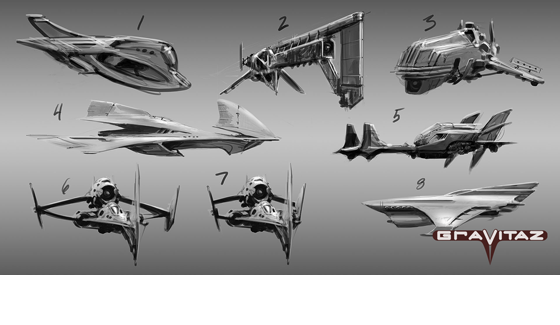 Answer: There are two areas in which we’re really focusing our differentiation: weapons, and track design. Weapons in racing games have always been a bit of a mixed bag in terms of effectiveness. A missile fires out, hits a car -- yay -- and then your opponent stops dead in his tracks, you can't swerve in time, and all you've done is knock yourself back. Not fun. So, skilled players just treat the weapons as recharges and instantly absorb them; mid- to high-level play might as well not have weapons at all. We believe that weapons in a racing game ought to affect racing. Rather than a missile that stops opponents dead in front of you, how about a weapon that shoves them out of the way? One that slings you ahead of people? A power-up that lets you bull through a crowd, knocking everyone back without hurting your standing? Weapons should be strategic, with a real sense of risk and reward. We're steering well clear of anything like Mario Kart’s infamous Blue Shell, or heavy “rubberbanding” physics, but... there's a lot that could be done to make weapons more relevant to the genre. Track design is another element that's gotten a bit weird. If you look back at Wipeout XL, or Hi-Octane, or any of the earlier racers, you'll see wider tracks. There's plenty of space, plenty of lines to take, and as a result, they were fun for just about anyone. Great players nailed the perfect route, novice players swung a bit wide, and you could dart around opponents and get a true sense of jockeying for position. Fast forward to current day: track widths have been cut nearly in half (by making the cars twice as big visually, amongst other tricks), and the experience has been carved down to just high-end players optimizing lines in tight alleys. We're going to widen the tracks back out, and work on giving players a sense of choice and risk in the paths they choose. We're also looking at adding shortcuts back to the genre: tactically advantageous side paths that you may or may not want to run depending on your skill level. "Well, I could try and stick that thin path up there, but man, if I fall..." or "Ok, those crunchers just went up, I can make it!" P.S. : More details regarding the vinyl stickers as a Backer reward in the next update. P.P.S. : As of this morning, GRAVITAZ is now a Kickstarter Staff Pick ...and we'd just like to say THANK YOU!! Update #2: Day 6: GRAVITAZ launches into the race! We’re already 14% of the way to the finish line. DENVER, CO (April 24, 2012) — Glass Bottom Games LLC, an independent developer of video games for PC and mobile devices, today announced that the company has engaged Logitech, a world leader in computer accessories, to provide fans with the most fulfilling entertainment experience possible. As part of the company's Kickstarter campaign for its futuristic combat-racing game, GRAVITAZ, a limited number of pledges will include a complimentary Logitech F710 Wireless Gamepad. Supplies are limited to the first 20 backers at the new $65 tier. In GRAVITAZ, players fly jet-propelled hover vehicles for fame and glory on the rough-and-tumble courses of the world's first antigravity racing league. Players compete with computer and ghost opponents against time on delicate tracks scaffolded over the faces of skyscrapers and down through city streets with a diverse pool of vehicles, from scratch-built garage projects to high-end sponsored racers. Learn more about how to bring futuristic racing into the present at www.GravitazGame.com. ### About Glass Bottom Games LLC: Glass Bottom Games LLC is a Denver-based independent developer of video games for PC and mobile devices, such as The Savage Garden and GRAVITAZ. We will drink to your honor. 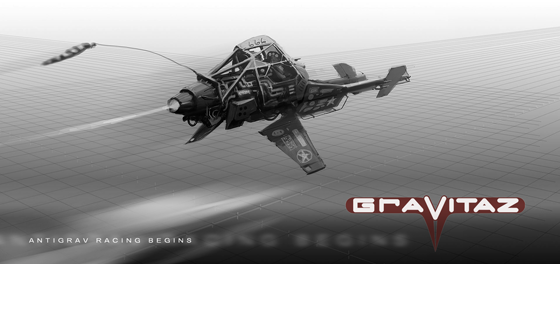 You will receive a downloadable copy of GRAVITAZ upon release. You will receive a downloadable copy of GRAVITAZ upon release. Also, your name will appear in the credits under a “Special Thanks” section. You will receive: 1) a downloadable copy of GRAVITAZ upon release. 2) A poster of our key visual concept art. 3) The aforementioned “Special Thanks” credit. You will receive: 1) a downloadable copy of GRAVITAZ upon release. 2) A t-shirt featuring one of our race team designs. 3) The aforementioned “Special Thanks” credit. You will receive: 1) a downloadable copy of GRAVITAZ upon release. 2) A signed copy of Gravitaz: The Card Game. 3) The aforementioned “Special Thanks” credit. You will receive: 1) a downloadable copy of GRAVITAZ upon release. 2) A signed copy of Gravitaz: The Card Game. 3) The poster of our key visual concept art. 4) The t-shirt featuring one of our race team designs. 5) The aforementioned “Special Thanks” credit. You will receive: 1) a downloadable copy of GRAVITAZ upon release. 2) A physical model of an in-game Spinner vehicle. 3) A signed copy of Gravitaz: The Card Game. 4) The poster of our key visual concept art. 5) The t-shirt featuring one of our race team designs. 6) The aforementioned “Special Thanks” credit. You will receive: 1) A signed, limited edition physical boxed copy of GRAVITAZ. 2) A signed copy of Gravitaz: The Card Game. 3) A physical model of an in-game Spinner vehicle. 4) The poster of our key visual concept art. 5) The t-shirt featuring one of our race team designs. 6) The aforementioned “Special Thanks” credit.